For the first time after 25 years, 17 masterpieces of tapestries chosen among 8 collections have returned to their place of origin for an exhibition at the Uffizi Gallery. In 1987, the Uffizi lost a part of its most important collections due to problems with the conservation of the tapestries: the light, dust and tensile stress deteriorate those artworks rapidly and the colors fade day after day. For this reason the collection has been kept for many years in a room appropriate for its conservation, waiting for the opening of dedicated rooms equipped with ideal lighting and air-conditioning systems on the ground floor of the Gallery. In this temporary exhibition, you can admire a series of works which illustrate and recount, better than any history book, the opulence and magnificence of the European courts during the Renaissance and about the story of the Passion of Christ. – Episodes of the stories of Jacob, of the Parties at the Court of Valois and the Battles of Hannival, Flemish artists (from the 1500s). – A devotional cycle by Salviati, another of hunting episodes (by Vasari), the Passion of Christ (by Alessandro Allori) and of Christ in front of Herod (by Ludovico Cigoli, Florentine School (1500-1600s). Tapestries in the past were almost considered objects to worship, shown during important ceremonies in court life. A strong tradition and passion passed down through noble families such as the Medici, who had an important collection and really cared about it. 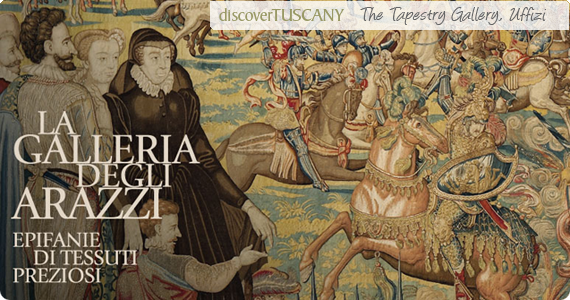 Through this journey through the past, you can also discover the ancient techniques through which the tapestries were made and at the same time, admire the complex art of restoration carried out by the Florentine school, considered one of the most important in the world today. An educational part of the exhibition will illustrate several restored works alongside ones that have not been restored to contrast the old, but still bright original colors with the pieces having gone through restoration. The exhibition is at the Uffizi Gallery up to June 3, 2012. Tickets costs 11 € full price and 5,50€ for those that qualify for reduced tickets. It is also free on Saturdays from April 14th up through June 2nd, at the following times: 9.30; 11.30; 14.30; 16.30. We highly recommend you buy your tickets ahead of time for the Uffizi to avoid lines!